On one hand we reach new heights like being able to actually take pictures of an honest-to-god Black Hole and on the other hand, legislature in the city of Los Angeles has undergone a radical change and essentially made poverty illegal. As we move towards more progress, instead of equalizing, the quality of lives keeps in increasing in the same direction; the rich keep getting richer and the poor keep getting poorer. Rising rates of rent along with a fall in wages have resulted in thousands & thousands of people in and around Los Angeles to resort to living in their cars and RVs to cope with the expenses. Going by the recent reports, about 7000 people live in their cars in a city like Los Angeles. Despite being forced to live out of their vehicles, these people try to live their lives as well as they can. But guess who the authorities have it out for? Yep, it’s the homeless. That’s the biggest issue; not corruption, unemployment or even the fact that there are so many people without homes due to high living expenses and not enough wages. Due to the rising number of people sleeping in cars, certain churches and welfare organizations such as the New Beginnings Counselling Center have taken the initiative in the ‘Safe Parking Program’, which provides safe and peaceful parking places for such people. But with the new laws being passed, programs such as these have been kicked right over to the apparently wrong side of law. Under these recently passed laws, it is illegal to sleep in a car or RV that is parked in a residential area from 9 pm to 6 am. Areas within a block of a park, daycare, or school are entirely off limits. Fines ranging upto $75 can be charged, which is royally unfair and simply impossible for people in their financial conditions to pay. This is not the first time such a policy targeting the homeless has been implemented. Seattle has seen the use of razor wire fences to keep the homeless from camping & San Francisco even went as far as using robots to scare away the homeless & report them to the police. 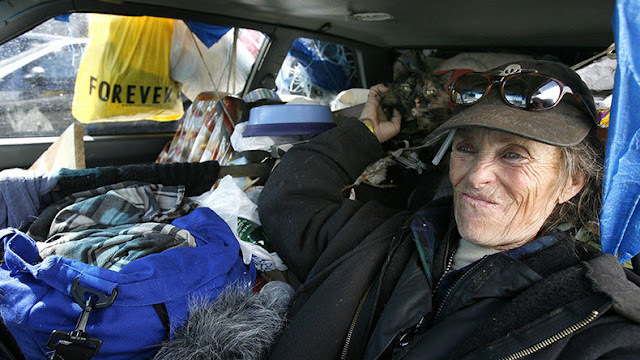 A man accumulated a fine of about $110,000 in Canada due to similar legislation, for (you guessed it) being homeless. Thankfully, this policy is up for debate and appeal in July, where advocates for the homeless are bound to put up a good fight. Instead of making life more difficult for the homeless and passing such absurd legislation, the resources and time of the government would be better devoted to try and help them become active, contributive members of the the society again.